The Hall is a brand new community centre in the heart of East Village, the former athlete's village from the 2012 Games. The Hall is run by The Yard Theatre, with The East Village Trust. The Hall is a new take on the traditional village hall. A brand new community centre in the heart of East Village, run by The Yard, a theatre with a reputation for innovative work in community settings, with the East Village Trust (a trustee group of East Village residents and local stakeholders). 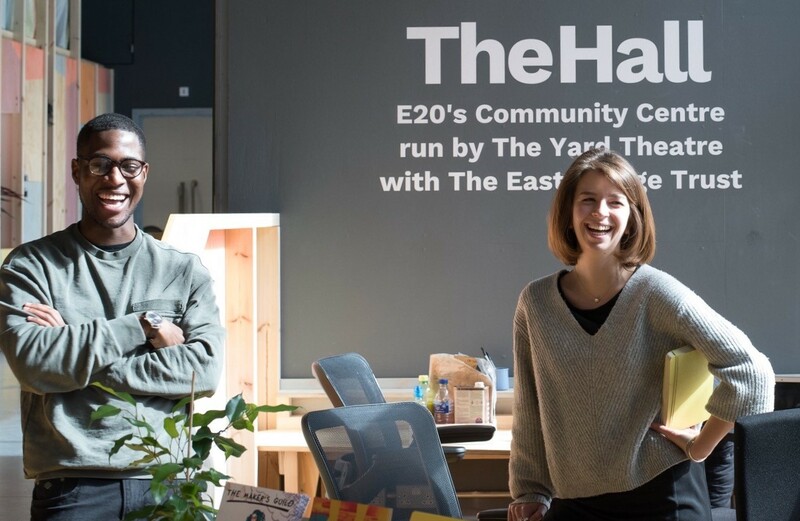 After three years of running Hackney Wick’s community centre, Hub67, The Yard are delighted to also be opening The Hall – a place for people to come together, to discover themselves and their neighbours, and to help build an exciting, sustainable community. Come in and see the beautiful new space built by Practice Architecture, meet the team and tell us what you think. Activity will be gradually added as the weeks go on. The Hall is officially opening its doors to the public and we would like to invite YOU to our opening party on Saturday 27th April from 1pm – 4pm. The Hall is a new take on the traditional village hall, run by The Yard Theatre, with The East Village Trust. It’s a brand new community centre in the heart of East Village. and loads of fun community workshops! Come and have a look at The Hall, meet the team who will be running it, and celebrate your new community space. Join the Facebook event now! The Hall will have a thriving programme of accessible activities and events for the community to get involved in. Check out the timetable below for more information. The Hall is open for people to drop in and get some work done. Whether you’re looking for a quiet place to finish your homework or a desk to send your emails from, there’s a space – and a cup of tea – waiting for you! The Hall is the perfect location for parties, meetings, workshops, rehearsals and events. We’re keen to hear from residents who want to set up their own activity, run events or use The Hall in any number of exciting ways. To chat to the local team about what you might do in the space, email eastvillage@theyardtheatre.co.uk and we’ll go for a chat! Over the last few months, we spoke to hundreds of residents living in East Village, wanting to find out how the centre can best serve its community. We’ve compiled those findings into a report you can read *here*, but it’s very much still a work in progress; we’ll keep building and evolving in response to local people. So come on in, tell us what you need! The Hall is run by The Yard Theatre, on behalf of East Village Trust. Day-to-day, the space is looked after by the local team: Steven and Katherine. They’d love to meet you. Address: The Hall, 2 Victory Parade, E20 1FS. Map here. Opening Times: The Hall will be staffed by our friendly local team 10am – 6pm, Monday to Friday. Drop in and say hi.